There are obvious spoilers in this so if you haven't watched this week's episode of "The Walking Dead," stop right here. Season five's second episode was one of reconnecting, discovering a new "survivor," going on the grossest food shopping trip ever and attending a BobBQ from hell. AMC offered up an inside look into "Strangers" and the video, followed by a sneak peek of October 26th's episode, are embedded below. In the peek into this week's episode, they failed to mention the two most disturbing and talked about scenes. You know what I'm talking about. One was Daryl dropping that water jug...am I right? Kidding. Although I did cringe. 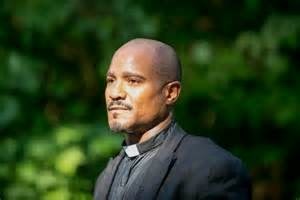 After saving Father Gabriel (Seth Gilliam) from certain demise and then heading to his church, the group goes to the local food bank to stock up. Did we think this was going to be an easy supply run? Of course not and it isn't. A bacteria-laden soup that is full of decaying corpses and smells like a sewer puked awaits and demonstrates that this group will stop at nothing to stock up on canned goods. Clearly jumping into this filth couldn't be too healthy and when Bob gets attacked and goes under, we can only imagine how many microorganisms he ingested. Also, was he bit or scratched? Is this why he later kissed Sasha (goodbye? ), left the church then became tearful? Did he know he was slowly turning and was he going to off himself to protect the group? As Bob weeped and contemplated his life, Gareth and his thugs attacked and made a tasty snack out of him. This scene mirrors Dale's fate from the comic books and left many wondering if the leg meat they were eating, was tainted. In an interview over at The Hollywood Reporter, they speak with Andrew West (Gareth) and get a leg up on this situation. THR: Bob was outside of the church crying — just hours after a close call with a walker. Did Gareth and company make sure Bob wasn't bitten when he was underwater? Comics readers may recognize that element of this story. Right! Obviously the scene is not just inspired by but also heavily drawn from the comics. Some of the language is the exact same; a lot of the language is also similar or the same. What's interesting is in the comics, it's Dale that they pull off from the church and into the woods. And in the comics, we know what we know that happens to him. What's cool about the show is that it does draw directly from the source material but it's not always the same. Bob is a completely different character than Dale. I wouldn't recommend people speculate too heavily on if the show is following the comic; it veers in and out of that world and that will continue. How this whole situation with Bob and Gareth plays out is going to be interesting. There will be more surprises to come. What did you actually eat to double for Bob? They've got some culinary skills! It was some type of pork and it was pretty delicious! I'm a pork fan and I don't know if it was pork shoulder but was tasty stuff! I gladly skipped lunch that day. It was good, and it made shooting that scene much easier to have something so tasty. The last line of the episode wasn't that hard to say! THR: Is there hope for Bob or is he a full-course meal? I feel like there's hope for everyone until you see them with green skin and rotting flesh or a bullet in the brain. It'd be wrong to say that it's hopeless for anyone. We saw Hershel get around for a long time on one leg. I wouldn't want to say it's hopeless for Bob; that would be misleading. The juxtaposition of the survivors in the church enjoying a rare moment of happiness against Gareth eerily talking to Bob just goes to show that no matter what, you can never let your guard down in this world. The sneak peek of next's week's episode shows that the group (obviously) realizes that Carol and Daryl as well as Bob, are MIA and think Gabriel has something to do with their disappearances. Do you think so? What did you think of the episode overall? Tune in to AMC on Sunday, October 26 at 9 p.m. ET for "Four Walls and a Roof." You can also read the full Gareth interview over at THR by clicking here.